Yahoo! I found figs in the store yesterday! I bought a bunch and will enjoy them throughout the week. Tonight we’re serving them up on crostini with some cheese, bacon and honey. They’re ridiculously good! How I wished I had a glass of Veuve (97 Reserve please) to wash these down and a bit of privacy while I made a pig of myself turning 6 servings into 1. Cut 6 slices of bread from the baguette and place them on a baking sheet. Shred the Havarti cheese and crumble the blue cheese. Place the baguette slices in the oven and turn the oven to broil. Broil until they’re just starting to turn golden. Remove them from the oven. NOTE: This will only take 1 – 2 minutes so don’t walk away from the oven and check them continuously. Turn the oven temperature down to 425F. Top each slice with fig slices. Add a few bits of bacon and blue cheese and top with 1 oz of the Havarti. Return to the oven and bake until the cheese has melted (about 3 – 4 minutes). Remove from the oven and drizzle lightly with honey. Serve these lovely little bites warm. A side of fig jam or a glass of champagne wouldn’t hurt either! Try Fontana cheese instead of Havarti or any other mild white cheese you can get. If you don’t like blue, and I really hope you do, but if you don’t…try shavings of Parm or fresh goat cheese instead. Plums would be a great substitute to figs if you can’t find those. The figs were ripe and perfect! That’s easy to make and tasty too. Thanks for sharing. Enjoy your Sunday! mmmmmm there are so delicious….!!! Thank you!! These turned out nicely! Fresh figs with blue cheese, candied walnuts & honey … my favorite fall dessert! 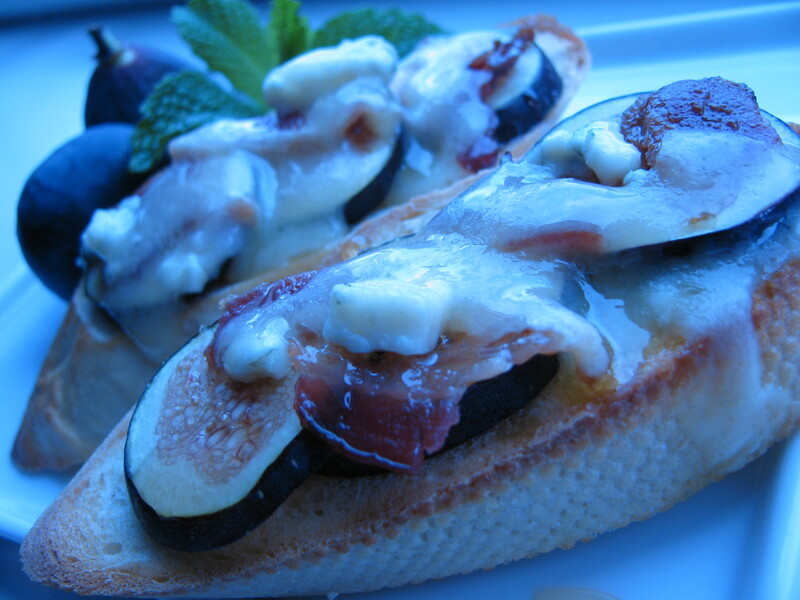 Fig heaven: bacon, cheese, and honey on a fig. Stop it. Love this post. We make something similar at home… great minds think alike. Great blog!